The words ‘great’ and ‘legendary’ are not easily used in Latin America – even for revolutionary leaders much less for cultural figures. Traditions are old, born of native, African and sometimes Spanish realms, where they are sometimes a lot older and these take precedence over the figures that help carry them forward so that future generations can learn from them. So perhaps it might not be appropriate to call Totó La Momposina ‘great’ or a ‘legend’, but being a standard bearer for the Colombian traditional music and dance must count for something. However, as I listen to Tambolero I am really tempted to use just those words to describe her work although she would vehemently disagree. She is, after all – she says – just carrying on a tradition that is great and legendary. Now, that would be hard to argue with. Tambolero is a product of more than fifty-five of blood and sweat and probably a river of tears as well. 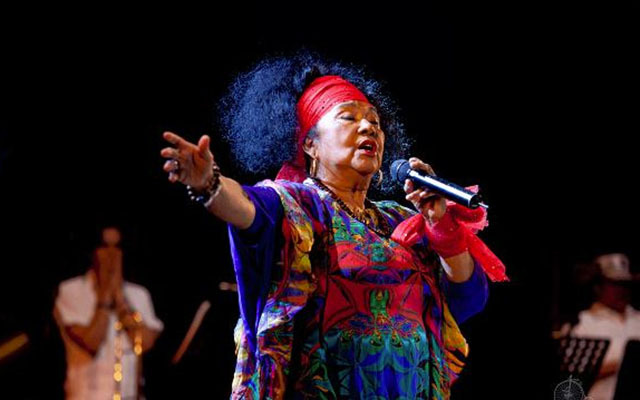 It began in in the Caribe-imbued Pacific regions of a Colombia in the 1960’s when Totó La Momposina first began to sing in and dance in a group that she founded there and continued back and forth in England, which represented a very special calling for her. So, she left Colombia and her family to live and perform there for years. When an opportunity to perform at WOMAD in the 1970’s came her way, she wowed her audiences and caught the eye of Peter Gabriel and those wonder folks who brought us RealWorld. Still, it took several decades and performances in England and Colombia, her country to which she returned many times for this remarkable record to be brought to fruition. Her son-in-law, husband to her daughter Eurídice – John Hollis – had a large hand in this, along with Phil Ramone. This iconic production of music and dance is a result of that labour of love. The dance is not visible except from a couple of photographs and we do not actually see the main protagonists of this – daughters, Eurídice and Angelica María. I, for one, will be looking for any video production that documents this. The music, however, is extremely well documented. Twelve songs, featuring traditional music and dance from ‘garabato’, ‘puya’ and ‘cumbia’, to traditional music such as ‘sexteto’, ‘gaita’, ‘afro’ and ‘chandé’ fill this record with extraordinary beauty, native and African gracefulness. Two things are important to note here. These are not so-called folk forms. Totó La Momposina would have nothing to do with that for they are traditional forms that go back 157 years and more. However, even if the star of the show might be too diffident to accept, they represent ‘the pinnacle’ of a musical civilisation. 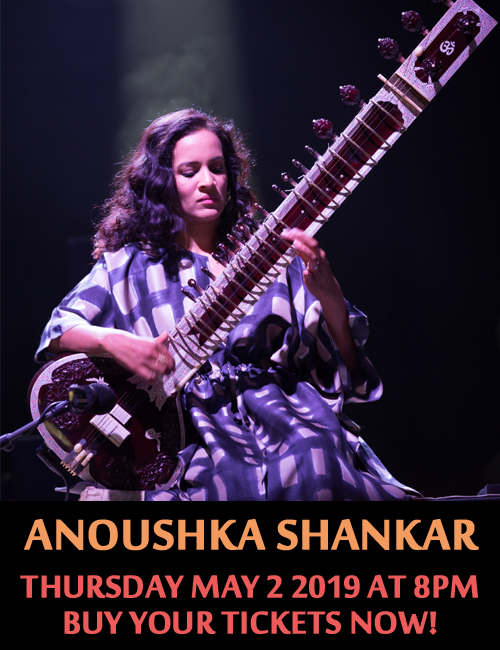 Her distinctive readings of this glorious music and dance have all to do with this. It may be a sign of the times that we are attracted to such work, and civilisations that invented it and refined it over centuries and if so, then this is a welcome sign. The more we know of such music and dance through artists such as Totó La Momposina, the more we will learn about older instrumentalists and vocalists – storytellers who carry forward their art over from living traditions purring away as ever, but with a superb ear for the luminous music and dance; elegant and nuancing as well as visceral and exciting. And this is probably the most consistently compelling performance launched by the ‘tamboleros’ of that region, with wonderfully clarion-calling drums alluringly conversant with other instruments and voice as it all comes together in the ebullience and vitality of dance. And so watch out for the profoundly uninhibited vocals of “Adiós Fulana” and other songs from end to end where clarity of annunciation nestles cheek-by-jowl with extended tonal colouration. Speeds are fastidiously chosen for the sake of expressive immediacy and dramatic moment. The overall effect is rich beyond compare. And if you follow the historical text which also includes lyrics to the music you too will be drawn to the inner wonders of this visceral and shimmering journey. There is rarefied sophistication – never super-polished – that reveals the heart of the culture and artistic tradition of Pacific Colombia. What you will also be left with is characterful singing that brings an unusual and penetrative interpretation of an art that makes Colombia so great. A last word: I would be remiss if I did not mention a particular favourite of mine, which is “Dame la Mano Juancho’ penned by Juan Lara, who appears in a poignant photograph with Totó La Momposina. That and the song are a picture and music worth a thousand words. Track List: Adiós Fulana; El Pescador; Chi Chi Mani; Curura; Gallinacito; La Sombra Negra; Dame la Mano Juancho; La Candela Viva; Dos de Febrero; Malanga; La Acabación; Tambolero. 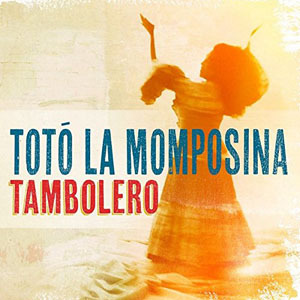 Personnel: Totó La Momposina: lead vocal; Marco Vinicio: tambor hembra, chorus, bombo (3); maracas (2 & 12) and guache (1 & 12); Paulinho ‘Batata’ Salgado: tambor hembra, chorus, maracas and bongos (3, 6 & 10); Dario Castro: Llamador, tambor hembra and chorus; Rafael Ramos: bombo, chorus and guitar (3, 6 & 10); Avelino Sánchez: tiple and chorus (3, 6 & 10), Eduardo Martinez: maracas (1, 4, 7, 9 & 11), claves (3, 6 & 10), gaita hembra (11) and gaita macho (4 & 7); Mayte Montero: gaita hembra (4 & 7), gaita macho (11) and chorus; German Vargas: chorus (2, 8 & 10), maracas (2), guache (8) and dance; Eurídice Oyaga de Hollis: chorus and dance; Angélica Maria Oyaga: chorus (2, 8 & 12) and dance; Maria del Mar Hollis: chorus (1 – 4, 6, 8, 10 & 12); Oriana Melissa Hollis: chorus (1 – 4, 6, 8 & 12); Néstor Venegas: double bass (3, 6 & 10).